On August 22nd from midnorthern latitudes, Saturn is becoming lost in the sunset, but look for bright Venus and use it to track down Mercury. Mars is a little bit higher up in Virgo and will be visible longer after sunset. The planet Venus passed conjunction with the sun onJune 9 and is now emerging into view in the western evening sky. But it will bea long and tedious process. Even by the end of September this planet will stillvery low at dusk. Look for Venus just as evening twilight fades, but don'twait too long, for it will set only about an hour after sunset. Scan just abovethe western horizon about 20 to 30 minutes after the sun goes down. Binocularswill certainly help you pick out Venus' silvery spark from the still-brightsky. As the season grows cooler Venus will slowly rise higher, until it shinesas a brilliant "evening star" in the twilights of winter. But Venus is currently not alone, for also nearby are theplanets Mercury and Saturn. Over the past week these three planets have been clusteredrather closely together. Unfortunately, their close proximity to the sun causedthese planet bunchings to be visible only with difficulty against the brightbackdrop of evening twilight. 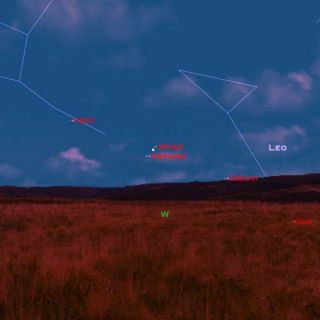 They are still relatively close together thisweek, although all three are so very low to the western horizon and so deeplyimmersed in the bright sunset glow that it is debatable that — aside from Venus— that the other two planets will be observable. Your best bet is to use binoculars and scan near the westernhorizon about 15 to 30 minutes after sunset. In September, Saturn disappears into the fires of sunset andis replaced in the planet trio by Mars. So it will then be Venus, Mercury andMars that will spend much of September tightly grouped together. Unfortunately,their proximity to the sun will continue to be a problem, so they'll continueto be visible only with difficulty against the bright backdrop of twilight. Using binoculars and scanning the horizon somewhat to thesouth of due west about 15 to 30 minutes after sunset on Sept. 1, you just mightbe able to pick up Venus, Mercury and Mars forming a right triangle. And belowand to the left of this planet trio will also be a narrow crescent moon just2.1 days past new. Viewers in the southern U.S. will have a bit of an advantagein that this group will appear a bit higher above the horizon. On Sept. 7, the Venus-Mercury-Mars grouping will resemble anisosceles triangle,with the Mars-Mercury and Mars-Venus sides measuring about 2.5 degrees in lengthand the Mercury-Venus side about 4 degrees. And located about 10 degrees(roughly the width of your fist held at arm's length) to the upper left of thetriangle will be Spica, the brighteststar of the constellation Virgo. Venus and Mars will be separated by only 0.3 degree (lessthan the apparent width of the moon) on Sept. 11. If you can locate Venus withbinoculars in the twilight, Mars will be situated just below and to the left ofVenus. Mars will appear only 1/174 as bright as dazzling Venus, so don't expectto see it right away. The next evening, Venus is in conjunction with Mercury, butthey're more widely separated at 3.6 degrees; Mercury will appear below and tothe left of Venus. At magnitude +0.2, Mercury is much brighter than Mars, butstill only 1/44 as bright as Venus. And creeping in from the east is Spica, about7 degrees to the upper left of the three planets. Come Sept. 18, Venus, Mercury and Mars will form anequilateral triangle, whose sides are 4 degrees in length. And Spica nowbecomes a part of this array, sitting only a few degrees to the left of thetriangle. Whether you'll actually be able to see it, or the even fainter Marsagainst the backdrop of the bright twilight sky, however, is debatable. But to have three planets and a bright star crammed into arelatively small spot in the sky does not happen very often, so I would urgeyou to give it a try.